Well, I made 9 loaves of cinnamon bread last night for my boys' teachers. This is my favorite gift to give during the holidays. In fact, the illustrator went to a meeting last week and was asked where the cinnamon bread was since it is the holidays. I honestly did not have any sugar at the time, but I will definitely be making this for his meeting next week! This is the one recipe that was a "must make" gluten free. 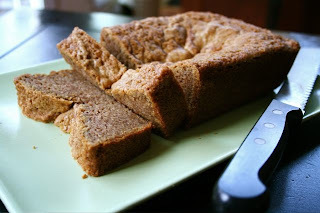 Cinnamon bread is a staple in this house and it never sticks around for long. I know, it is a weird looking bread since it sinks in the center, but that is the best part. I used to hate making it for other people because of the way it looks. It is not your usual pretty dome shaped bread. The recipe calls for baking soda, so it should have an acid based liquid to help it rise. I have made it both with and without the acid based liquid (buttermilk or yogurt) and the preference is without the acid. If forms this super moist gooey center, which is the best part! The photo above is not gluten free. I wanted to give you a frame of reference on how the appearance changed with the gluten free flours. Really not that much, so it passed that test! This loaf is gluten free. The gluten free bread actually got higher marks than the gluten loaf! 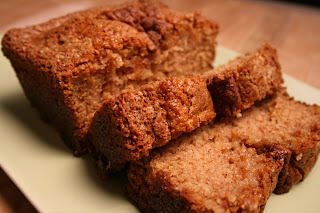 The addition of my favorite gluten free flour, buckwheat, helped give this bread a better consistency! 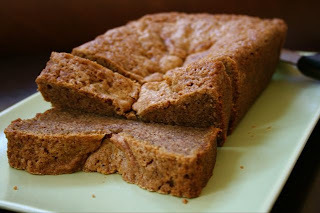 Is slices extremely well and has the perfect cinnamon bread chewy texture! So, if you are looking for a nice festive loaf of bread to serve your holiday guests or to give as a gift, this is a beautiful dairy free, gluten free and egg free gift! Preheat oven to 350 degrees. Line a 9x5 loaf pan with parchement paper and spray with cooking spray. Combine oil, sugar, flax egg, vanilla and dairy free milk in a bowl. In a separate bowl, combine baking powder, baking soda, flour, salt and cinnamon. Gradually add the dry ingredients into the wet. Mix just until combined. Pour into prepared loaf pan. Sprinkle with a little cinnamon and sugar. Cook for 50 to 60 minutes or until a toothpick inserted in the center comes out mostly clean with a little bit of gooeyness on it. You can remove it from the pan after it has cooled for about 10 minutes. This sounds and looks delicious! I am going to try making this with So Delicious coconut milk. I bet it will be fantastic! through the screen! I want to try this, thanks! I have a 9 month old with a severe milk protein allergy and so, with nursing, i am stripped of milk as well. I love your blog. thank you! would this work with honey instead of the sugar? have you ever tried it? Can you explain a flax egg a little more? Is is just the flax and water, or flax, water, and an egg? Heather Collea - I use the 1 TBSP flax meal mixed with 3 TBSP hot water (let it sit for about 5 minutes to form a gel) for one egg in some recipes. I would only do this for up to two eggs in a recipe. 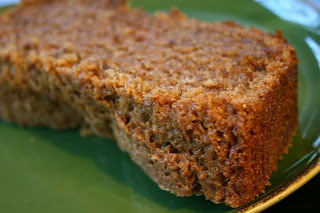 Just remember that your baked goods may not rise as much with the "flax egg" as they do with regular eggs.